Moreton Island stands at the top of Moreton Bay and is the third largest sand island in the world. Gracing the shores of the Western province is the world famous Tangalooma Island Resort with their dolphin feeding one of the greatest spectacles available in Brisbane. It is rare you can see Dolphins close up and personal in the wild like this with Monkey Mia on the west coast another famous location where you can do this. The island is a marvel that many have never visited, but should. 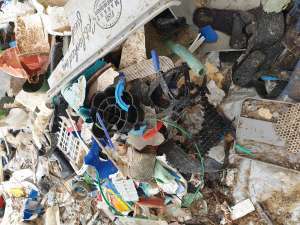 Recently Cyclone Oma had a crack out southern QLD and our timing for this clean up was perfect as we could get all the debris that the ocean threw back at us before it is covered by sand once again. Working with Queensland Parks and Wildlife Service, we had a plan and that was to hit the Eastern beaches and clean as much as we could. They had already removed all the larger items washed in including tyres and tanks etc. We would focus on the plastics. As per usual, our Noosa Crew got the jump on everyone by heading over early. Tangalooma Resort took over Mark and his vehicle, along with our new truck, on the Tuesday prior and Mark got stuck in straight away. By the time Maura and I got there, Mark had a couple of trailer loads already and knew where the hot spots were. On the Thursday our mission was to set up the bulk bags at every mile marker on the eastern beach so that anyone could lend a hand. 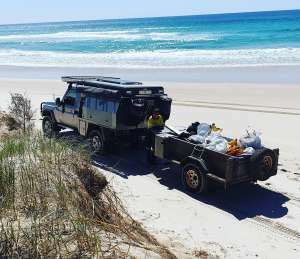 With the help of Moreton Island Adventures, over 200 cars between Thursday and Saturday were handed a flyer to ask them to help and many took up the option. Unfortunately we had a few issues with the new truck with two tyres rolled off the rims due to running the tyres pressures too low but thankfully bush mechanic Mark saved the day and also got the bulk bags out to the beach. The big day was set for Saturday and on Friday night, the heavens opened with 70mm of rain falling at Tangalooma. This certainly changed the track conditions, making it so much easier. Luckily we had a nice apartment at the resort courtesy of Tangalooma so we watched the storm roll by in the comfort of a nice apartment. Waking in the morning and whilst it was overcast, the rain stayed away and we loaded up the bus provided by Australian Sunset Safaris. In fact the cloud cover made it a bit cooler than the days prior so it was quite pleasant cleaning conditions. 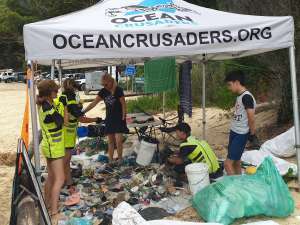 The team from Tangalooma Resort and the Eco Marines headed south to clean a 2km section, Mark, Maura and the Ringland’s headed further south than them and the bus load spent time cleaning the 3km either side of the Middle Road track. Meanwhile 4 of our amazing OC volunteers headed further north than this. Using the new truck we tried a new system of pouring the little bags into bulk bags. It meant we could reuse the bags several times and then the crane truck could lift the bulk bags onto the back of the truck. It meant the load was easier to contain as well. This took out a lot of heavy lifting which was a huge relief for the crew. 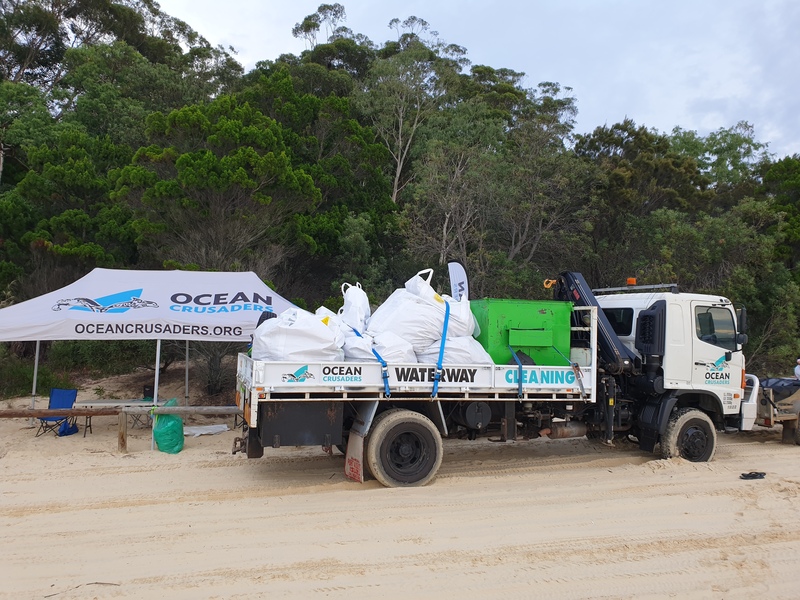 By 2pm the team had completed their mission and the bus headed back across the island whilst the OC crew headed north to collect the bulk bags we had left out for the 4WD crews. They had certainly been used and so whilst we can say there were 39 officially registered to clean, we can’t say how many actually did. However the feedback was excellent and I am sure a good number of 4wd’ers played their part in the clean up. After picking up all the bags it was time for a clean up of the crew and off to Blue Lagoon we went. It was amazing to enjoy the fresh waters of this lagoon before heading back across the island. Sunday morning and we did the audit and weighed all the bulk bags. I can tell you that the new crane scales were a welcome relief to having to weigh what ended up being 1,973 kg of debris. We are joking that we only removed 11 bags of rubbish, but when one of those bags is 170 kg, well you get the drift. Once again we have to thank the amazing volunteers for their huge efforts. Without these people our job is so much harder. On this occasion we also had some huge support in the form of our sponsors. Our main sponsor was the amazing crew from Spinnaker Sound Marina who provided funding to help us run this event. On the island we couldn’t have done this without all the companies that showcase this island every day. Tangalooma Island Resort not only moved our vehicles on and off the island, they provided accommodation for our crew and discounted transfers and accommodation for other volunteers. Moreton Island Adventures provided discounted barge fares and also handed out our flyers to every vehicle which made this event so much easier than had we not had that simple little effort. They also took our ute back and forwards for us too. MICAT is an impressive vessel. Australian Sunset Safari’s came to the party with a bus for the day. This enabled our volunteers to get across to the Eastern Beach for the clean and Lee our captain was awesome. We also had Sunrover Tours offer accommodation at their facilities. Without support from these groups this event simply doesn’t happen. In June 2020 we intend on running this event again and will attempt to run this as an annual event from now on. If you haven’t been to this island, make sure you don’t miss out next time.